Opposition parties on Tuesday said that the Education Ministry should be abolished if it pushes ahead with the planned introduction of the controversial state-authored history textbook. Calling it the “Park Geun-hye textbook” after the incumbent president who initiated the drive to mandate state-authored history textbooks, they called for a complete abolishment of the plan. “The textbooks are not just partly wrong, but need to be retracted as a whole,” said Rep. Yoo Sung-yeob of the People’s Party, who heads the parliamentary culture and education committee. 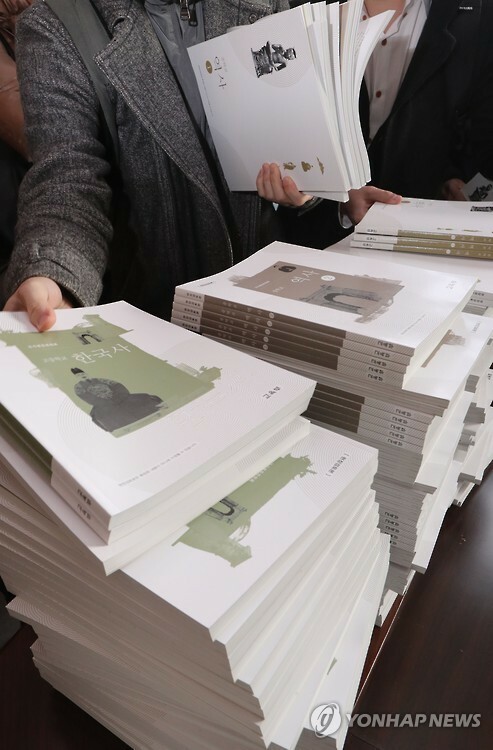 On Monday, the Ministry of Education and National Institute of Korean History unveiled draft copies of three history textbooks stipulated by the state, which they claimed were designed to assert the country’s legitimacy and remove political bias. Opposition politicians and some civic groups suspect the move to introduce state-compiled books is an attempt by President Park to glorify the military dictatorship of her father. Park’s father, Park Chung-hee, was a military strongman who ruled the country for 18 years until his assassination in 1979. 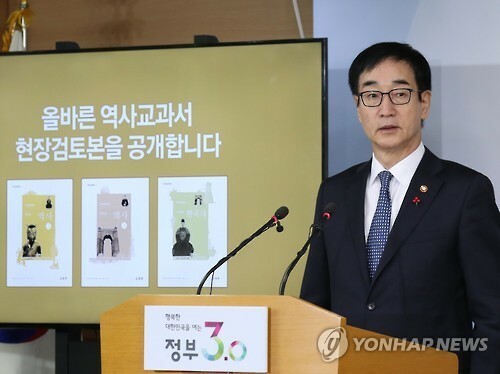 One of the newly released history textbooks is 286 pages, about 100 pages shorter than the current books, according to Rep. Do Jong-hwan of the main opposition Democratic Party of Korea. There are eight publishers producing different textbooks that schools can choose from. The government plans to replace these options with one state-authored book. “While the pages were cut by a third, the modern history part has only been reduced by 0.4 percent. It is thought that the part about the former President Park Chung-hee administration increased,” he said. Rep. Yoo Eun-hye of the Democratic Party of Korea also pointed out errors in the draft copy. The nation’s superintendent of education association released a statement Monday denouncing the textbooks, calling for the ministry to immediately discard them. “The whole process of the project and the intention was against the Constitution and cannot be justified. It does not even deserve the public’s review,” the statement said. A union of some 2,000 middle and high school history teachers echoed the statement Tuesday, saying the government’s unilateral distribution of history textbooks is not appropriate for the subject, which should be taught to nurture diverse thinking and critical points of view of students. “The textbook is poorly made without considering the current status of history education,” the group added. The conservative Korean Federation of Teachers Association also stated they cannot accept the history textbook as designated by the government. “The political stances of the writers are not balanced and it had stipulated wrong information, such as the date of establishment of the nation,” the group said. Education Minister Lee Jun-sik said Monday that the Ministry of Education and the National Institute of Korean History will confirm after Dec. 23 whether or not the introduction of the textbook in schools in March will go as planned. He mentioned a possible delay in the adaption of the books, adding they may only be tested in a small number of schools first. The Education Ministry previously revised the education law last December to use the state-authored textbooks from March, at least a year earlier than the previous plan.